Celestial mechanics is a branch of astronomy that studies the movement of bodies in outer space. Using a mathematical theory, it explains the observed motion of the planets and allows us to predict their future movements. It also comes into play when we launch a satellite into space and expect to direct its flight. Until English scientist and mathematician Isaac Newton (1642–1727) founded the science of celestial mechanics over 300 years ago, the movement of the planets regularly baffled astronomers or anyone who studied the heavens. This is because those bodies called planets, a word which comes from the Greek word for "wanderer," literally "wandered" about the sky in a seemingly unpredictable manner. To the early astronomers, the stars were fixed in the heavens and the Sun seemed to make the same regular journey every year, but the planets followed no such pattern. Their unpredictable behavior was especially frustrating to the ancients, and it was not until around A.D. 140 that Greek astronomer Claudius Ptolemaeus or Ptolemy provided some kind of order to this chaotic situation. Epicycle: A circle on which a planet moves and which has a center that is itself carried around at the same time on the rim of a larger circle. Gravity: Force of attraction between objects, the strength of which depends on the mass of each object and the distance between them. Also, the special acceleration of 9.81 meters per second per second exerted by the attraction of the mass of Earth on nearby objects. In what came to be known as the Ptolemaic (pronounced tahl-uh-MAY-ik) system, he placed Earth at the center of the universe and had the Sun revolving around it, along with all the other known planets. Ptolemy's system of predicting which planet would be where and when was described as the epicyclic theory because it was based on the notion of epicycles (an epicycle is a small circle whose center is on the rim of a larger circle). Since Ptolemy and most Greeks of his time believed that all planetary motion must be circular (which it is not), they had to keep adding more and more epicycles to their calculations to make their system work. Despite the fact that it was very complicated and difficult to use, his system was able generally to tell where the planets would be with some degree of accuracy. This is even more amazing when we realize that it was based on an entirely incorrect notion of the solar system (since it had the Earth and not the Sun at the center). Yet its ingenious use of the off-center epicycles, which were regularly adjusted, permitted the Ptolemaic system to approximate the irregular movements of the planets. This, in turn, mostly accounts for the fact that his incorrect system survived and was used by every astronomer and astrologer for 1,400 years. During the Middle Ages (period in European history usually dated from about 500 to 1450), the Ptolemaic system was dominant, and all educated people whether in Europe or in the Arabian world used it to explain the movement of the planets. By then, the system had the seven known planets riding more than 240 different epicycles. It was this level of complexity that led Spanish King Alfonso X (1221–1284), who was called "the Wise," to state that had he been present at the creation of the world, he would have suggested that God make a simpler planetary system. The clutter of all of this complexity was eventually done away with (although by no means immediately) when Polish astronomer Nicolaus Copernicus (1473–1543) offered what is called his heliocentric (pronounced hee-lee-oh-SEN-trik) theory in 1543. Copernicus placed the Sun at the center of the solar system and made the planets (including Earth) orbit the Sun on eccentric circles (which are more egg-shaped than perfectly circular or round ones). The Copernican system took a long time to be adopted, mainly because it was actively condemned for over a century by the Catholic Church. The Church objected to the fact that his system took Earth out of its stationary center position and made it revolve instead around the Sun with all the other planets. Although Copernicus could explain certain phenomena—for example he correctly stated that the farther a planet lies from the Sun the slower it moves—his system still did not have a mathematical formula that could be used to explain and predict planetary movement. By the time the Church was condemning the work of Italian astronomer and physicist Galileo Galilei (1564–1642), who defended the Copernican model of the solar system, German astronomer Johannes Kepler (1571–1630) had already published his three laws of planetary motion, which would lay the groundwork for all of modern astronomy. His first two laws were contained in his Astronomia nova ( The New Astronomy ), published in 1609, and his third was stated in his book Harmonices mundi ( Harmony of the World ), published in 1619. Basically, the laws state that the orbits of planets can be drawn as ellipses (elongated egg shapes) with the Sun always at one of their central points; that a planet moves faster the closer it is to the Sun (and slower the farther away it is); and, lastly, that it is possible to calculate a planet's relative distance from the Sun knowing its period of revolution. Kepler's laws about the planets and the Sun laid the groundwork for English physicist Isaac Newton to be able to go further and generalize about what might be called the physics of the universe—in other words, the mechanics of the heavens or celestial mechanics (celestial being another word for "the heavens"). Celestial mechanics is, therefore, Newtonian mechanics. Newton's greatness was in his ability to seek out and find a generalization or a single big idea that would explain the behavior of bodies in motion. Newton was able to do this with what is called his law of universal gravitation and his three laws of motion. The amazing thing about his achievement is that he discovered certain general principles that unified the heavens and Earth. He showed that all aspects of the natural world, near and far, were subject to the same laws of motion and gravitation, and that they could be demonstrated in mathematical terms within a single theory. In 1687, Newton published his epic work, Philosophiae naturalis principia mathematica ( Mathematical Principles of Natural Philosophy ). In the first part of the book, Newton offers his three laws of motion. The first law is the principle of inertia, which says that a body stays at rest (or in motion) until an outside force acts upon it. His second law defines force as the product of how fast something is moving and how much matter (called mass) is in it. His third law says that for every action there is an equal and opposite reaction. It was from these laws that Newton arrived at his law of universal gravitation, which can be said to have founded the science of celestial mechanics. The law of universal gravitation states that every particle of matter attracts every other particle with a force that is directly proportional (an equal ratio such as 1:1) to the product of the masses of the particles, and is inversely proportional (the opposite ratio) to the square of the distance between them. Although this may sound complicated, it actually simplified things because celestial mechanics now had an actual set of equations that could be used with the laws of motion to figure out how two bodies in space influenced and affected each other. It was Newton's great achievement that he discovered gravity to be the force that holds the universe together. Gravity is a mutual attraction or a two-way street between bodies. That is, a stone falls to the ground mainly because Earth's gravity pulls it downward (since Earth's mass is much greater than that of the stone). But the stone also exerts its influence on Earth, although it is so tiny it has no effect. However, if the two bodies were closer in size, this two-way attraction would be more noticeable. We see this with Earth and the Moon. Earth's gravity holds the Moon in orbit around it, but just as Earth exerts a force on the Moon, so the Moon pulls upon Earth. We can demonstrate this by seeing how the free-flowing water of the oceans gets pulled toward the side of Earth that is facing the Moon (what we call high tide). The opposite side of Earth also experiences this same thing at the same time, as the ocean on that side also bulges away from Earth since the Moon's gravity pulls the solid body of Earth away from the water on Earth's distant side. satellites and spacecraft, as well as the motions of stars and even galaxies. However, Newton's solution works best (and easiest) when there are only two bodies (like Earth and the Moon) involved. The situation becomes incredibly complicated when there are three or more separate forces acting on each other at once, and all these bodies are also moving at the same time. This means that each body is subject to small changes that are known as perturbations (pronounced pur-tur-BAY-shunz). These perturbations or small deviations do not change things very much in a short period of time, but over a very long period they may add up and make a considerable difference. That is why today's celestial mechanics of complicated systems are really only very good approximations. However, computer advances have made quite a difference in the degree of accuracy achieved. 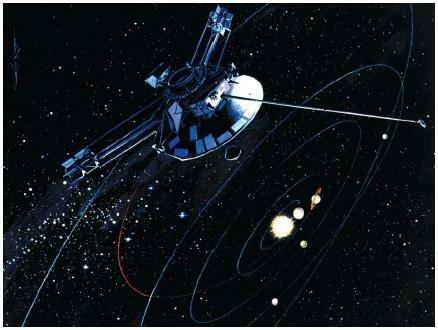 Finally, with the beginning of the space age in 1957 when the first artificial satellite was launched, a new branch of celestial mechanics called astrodynamics was founded that considers the effects of rocket propulsion in putting an object into the proper orbit or extended flight path. Although our space activity has presented us with new and complicated problems of predicting the motion of bodies in space, it is still all based on the celestial mechanics laid out by Isaac Newton over three centuries ago.